In 2000 I made a whole series of quilts using recycled clothing. 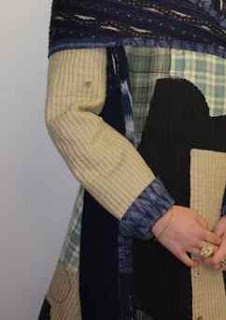 I liked them and galleries liked them but nothing really translated into sales so now 10 years later my airing cupboard is overflowing and when I was asked to take part in an 'Eco fashion' show as a graduate of Whitireia Polytech, I decided to use one of the quilts to make a coat. I hadn't quite worked out exactly how much fabric I would need. I ended up using 3 quilts but I am pleased with the results. It is amazing how good it looks on the size 12 model who wore it for the photos, it makes me look like a mushroom. It weighs a few kilos though.